Below are answers to some of the most common questions we have been asked over the years. If you have a question that is not on this list, please email Mr. Jeffres at john.jeffres@cobbk12.org. Do I need to get an instrument for my child to participate in band? In most cases, yes. It is the family’s responsibility to acquire and maintain the student’s band instrument. The school owns an inventory of some instruments such as clarinets in case of financial need. Later in the year, some students will be asked to move up to other larger school-owned instruments such as tuba, euphonium or French horn. These instruments are checked out to students for use in class at no charge. Parents pay only for supplies and for repairs of student-caused damage. Should I buy or rent an instrument? That is up to each individual family. A number of local music stores offer very competitive rental rates for the first several months. Of course, buying a new or used instrument is also an option. The main thing is that the instrument is of sufficient quality to play well, and in perfect working order. Where should I get an instrument? It is best to get an instrument from a reputable music retailer, preferably with a service department to keep the instrument in top working condition. Buying an instrument sight unseen over the internet or from a big-box retailer often does not provide the same quality of instrument, and no expert service. You will be given a packet with flyers from a number of local music retailers when your child is evaluated for their instrument assignment. How is my child assigned to an instrument? Each student is asked to come up with a list of three band instruments they might like to play. From this list, the student’s physical structure is evaluated to find the best match. Areas evaluated include mouth width, lip thickness, overbite, teeth alignment, palate height and width, tongue characteristics, finger length and width, and rhythmic aptitude. Based on this information, the directors will recommend the best fit. On rare occasions, none of the instruments on the student’s list will fit. In this case, the directors will make other recommendations. What if we already have an instrument? Can my child play that in band? In most cases, yes. There are two main points to consider. First, it must be an instrument that is a good match to the student. Some instruments require very specific physical features. Second, it must be in good playing condition. If it has been sitting unused for a while, it will almost certainly need professional adjustment. The directors are glad to evaluate used instruments to make sure they are in good playing condition. How much time does band take outside of school? In general, not very much! In order to be successful, at least some practice has to happen outside of school. The amount of time needed varies from student to student, so you are not asked to track how much time is spent practicing. In terms of performances, there are two required evening concerts in the 6th grade year. If my child really likes band, are there additional opportunities? Absolutely! 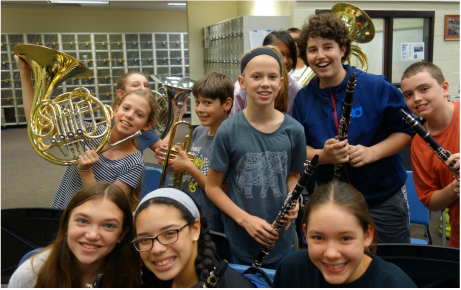 Starting in January, select 6th graders are invited to join our voluntary extracurricular groups, called morning ensembles. These small groups meet once per week before school, and present a concert each semester. Other opportunities include auditions for District Honor Band and All-State Band. As your child progresses, you will find that more and more opportunities arise for additional involvement. None of these extra activities are required, so you can custom tailor your band experience to match your child’s interests, aptitude and schedule!